Participating artists included Pat Arnao, Athena Chuang, Jeffrey Chuang, Linda Griggs, Philippa Kaye, Cynthia Ruse, Charlotte Sanner, Asher Schmerler, Sarah Schmerler, Katharine Staelin, Linda Stillman, Susan Woolf and Judson Wright. We could say art is investigation. Through creating new forms we explore existing and imaginary natural and artificial patterns, objects, ways of thinking, histories and futures. We could believe that art lets us play with alternate realities, which hopefully enable us to strengthen and deepen our connection to this one. Sometimes I think I understand what art is for, why we pursue it, make it, view it, share it. Other times it seems undefinable, mysterious, impossible to comprehend. I find the history of art and the existence of art more often perplexing than not. The culture that people have created since pre-human times is constantly growing, yet it seems to always be rooted in the unknowable. So I would be lying if I said that I knew why I wanted to bring you this exhibition. Spring Planting was initially conceived as the third of four new media installations which attempt to “paint” an experience of the seasons. 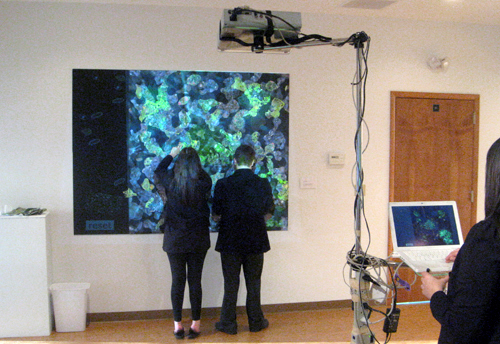 Each piece utilizes computer processing to change all the time, like a tree, or the weather. The new media installation Spring Planting is an interactive work which grows like a garden, revealing more of itself to the viewer as it is tended. Ultimately Spring Planting expanded from a single work by a solo artist to an exhibition of multiple new pieces by several artists working together in collaboration. My memories of gardening all involve working with other people. Gardening is all about growth. I believe that when we collaborate with other artists, we come up with things nobody would have thought of on their own, and the resulting work expands beyond the scope of what we are capable of imagining alone, a transcribed conversation between muses. Therefore, the key parameter of the work in the show is that each piece was created by artists conceptualizing the work together. Ideally a garden should provide nourishment. I hope that by viewing the works on display in this exhibition, you find that your visual appetite has been sated. Click here to see more images from Spring Planting. Click here to navigate through one of the interactive invitations to participate.